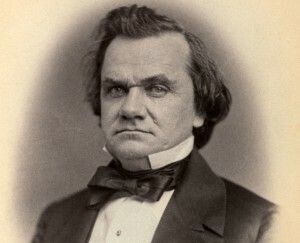 An Illinois politician, noted orator, and leader of the Democratic Party in the years before the Civil War, Douglas sought compromise in the slavery issue by arguing for popular sovereignty, whereby the citizens of each territory would, when applying for statehood, vote their territory free or slave without intervention by the federal government. This (among other things)became the subject of the seminal Lincoln-Douglas debates of 1858, which eloquently articulated the crisis facing the nation on the brink of civil war. Douglas defeated Lincoln in his bid for the Senate.